Santiago Ramón y Cajal (1852-1934) was an incredible scientist--he made invaluable contributions to neuroanatomy, including some of the most beautiful scientific illustrations since Vesalius. He was also a popular author, and above all a dedicated teacher, offering fatherly advice to students and young researchers on a wide range of topics. After he achieved success as a scientist, he wrote the first edition of Reglas y Consejos sobre Investigación Biológia (los tonicos de la voluntad) (1916). That work has been retranslated and presented by MIT Press as Advice for a Young Investigator. Although the wisdom contained in this slim, elegant volume is almost a century old, it is as fresh and useful today as it no doubt was then. What student or researcher wouldn't benefit from advice given by a mentor who has carefully examined his own life and career? Translator Larry Swanson writes in the foreword: Hard work, ambition, patience, humility, seriousness, and passion for work, family, and country were among the traits he considered essential. But above all, master technique and produce original data; all the rest will follow. 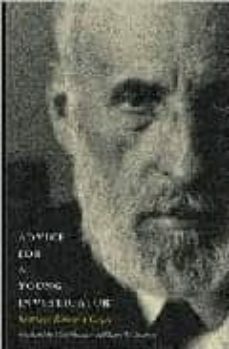 Cajal's guidance on such things as the scientific method, resolve, undue admiration of authority, passion for reputation, reading, and "diseases of the will" is priceless. Every page of this little book is filled with read-aloud gems: If a solution fails to appear after all of this, and yet we feel success is just around the corner, try resting for a while.... Like the early morning frost, this intellectual refreshment withers the parasitic and nasty vegetation that smothers the good seed. Bursting forth at last is the flower of truth. Whether you're writing a dissertation, conquering writer's block to get that paper submitted to a journal, beginning a new research project, or just starting out in a scientific career, Advice for a Young Investigator will inspire, edify, and amuse you. --Therese Littleton --This text refers to an out of print or unavailable edition of this title.